What is "Spoof Timezone" extension and how does it work? This extension is designed to prevent websites from detecting your possible location through either Intl.DateTimeFormat().resolvedOptions() or new Date() methods. 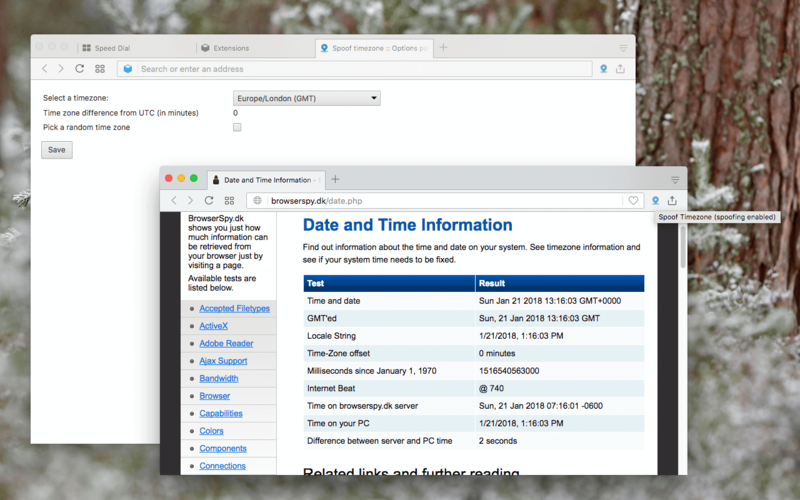 Basically, the extension adds a wrapper to both methods to change the browser's timezone to the one that user is defined in the options page. By default, the extension uses "Europe/London" as your timezone (GMT +0000). Note that you can easily enable or disable timezone spoofing by clicking on the toolbar button. To detect your current timezone, use the tool in the right-click context menu over the toolbar button. Based on your browser WebExtension implimentation the "inline" method might leak your actual timezone! How can I use this extension to prevent fingerprinting? Please check the Logs section. How can I find the correct value for the timezone when I am using a proxy server to connect to the internet? First, make sure your proxy software is working. Then visit https://ipleak.net/ website and wait until all your information is gathered. Now head to the "Time Zone" section and find the actual value of the time zone that matches with your current IP address. This is the value that you need to set on the options page! Can I ask the extension to find my current timezone based on the proxy server that I am using? Yes, as of version 0.1.4, there is a new item in the right-click context menu to automatically detect your timezone. You can even ask the extension to update the timezone on every browser restart. If your timezone is changed from the previous update, the extension will display a desktop notification to inform the user about the recent update. Note that this option is disabled by default.